Simple and elegant, the Abbie's Special is a Mission style dining room table unique in design. The legs remain stationary while extending the table top to insert additional leaves. The leaves on this custom wood dining table do not have skirts. The Abbie's Special can self store up to three leaves. Pictured in oak with FC-9018 Lite Asbury stain. Single pedestal tables are not able to self store leaves. Discover the beauty of this single pedestal dining table. 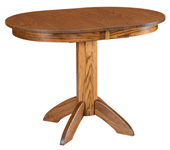 This Amish round dining table features gorgeous stepped up pedestal feet and a round base. Top Diameter: 42", 48" or 54"
Pictured in wormy maple with FC 4200 Almond Low Sheen finish. With the rustic barnyard look, the Amish Allegheny Trestle Table channels the beauty of a country setting. The feel of the mountains will go right into your kitchen or dining setting. Handmade by Amish craftsmen, this piece of furniture guarantees a life-long service. Definitely something many generations would be so proud to pass onto their successors. The Amish Allegheny Trestle Table showcase a Mission style design. It also features a 1 3/8 plan top with saw marks and breadboard ends. Sizes range from 60", 66", and 72" with max capacity of 6-8 pax. However, the trestle legs can only fit two chairs on both sides. This piece of furniture comes with a very flexible option for configuration. To make it a dining table that suits your aesthetic or the current theme of your home, you may choose from our wide range of wood types and finishing. Pictured in 42" x 72" plank top, rustic quarter sawn white oak with Michael's Cherry stain. Build your greatest memories around the Arlington Trestle Dining Table. The Arlington has big clydesdale feet and paneling on the ends for a uniquely solid look. Handcrafted by local Amish communities, this table is founded at home and will become a household heirloom. The Arts and Crafts Cabinet Table is a versatile yet luxurious piece for any space from small to efficient. This cabinet table uses the space in its base to house three convenient drawers and one shelf. The top can be compact when you need it to be, by incorporating a removable leaf. The base of the Arts and Crafts has the solidity mixed with the subtle curves of the Shaker silhouette, and decorative side panels. Handmade in America, the Arts and Crafts Cabinet Table will be whatever you want it to be as you change and grow with the years. Discover this beautiful Amish arts and crafts table! This eco-friendly dinner table is made of solid wood, with beautiful detail, lines, and custom finishes. The Arts & Crafts Trestle table is a gorgeous Mission style table with a trestle base that contributes to the table being built to last. The Arts & Crafts Trestle table is a traditionally designed table with simple yet elegant lines. Trestle tables are amongst the sturdiest style of table due to the added reinforcement of the trestle support bar connecting both leg sections at either end. This particular table has flared feet for additional strength and stability. Please specify if you would like your table to self store leaves (option available on some sizes only). A simple Mission table is what every home needs to get things done. The Asheville Leg Dining Table has a drawer in one side to help you build a more efficient household. The Aspen table is built to last with style and appeal. Reinforced with 4" slats and a "through tenon" design construction, this trestle table will remain in solid form far into the years. Through tenons show on all cross members and false tenons hide the attaching bolts. This table will top off any room with it's quality. Note: Video shows the table with both two kinds of woods and two stain colors table top and seats are in Elm with MV Special stain, base of table and chairs are in Brown Maple with Onyx stain. Custom finishes need to be ordered by phone. Elegant and modern, the Austin Dining Table is circular with four curved feet. The pedestal is made of four pieces-one for each foot-in a cross shape rather than a single large piece. A classic dining room will benefit from this heirloom table. The Austin Trestle Dining Table is an outstanding piece of hand craftsmanship. The trestle ends are ornately carved in a chalice shape. The truss continues this curving style with its exposed mortise joints. While the Austin is chic, it can be as classic or as country chic as you like depending on the smooth or plank style top. Built from domestically harvested solid hardwood, the Austin Trestle Dining Table is designed to last as long as the countryside. Standard top is 13/8" thick with the look of a plank top in either a solid top, or with 16" leaves - 16" leaves cannot self store. Also available is a 1" thick smooth top in either a solid top or with 12" leaves with self store options below. Pictured in natural/barnwood with FC 4200 Almond Low Sheen finish. Pictured with two leaves in Seely finish. Customize your solid wood, Amish dining table with options in our drop-down boxes (shown top right). The Barstow Dining Table is an impressive trestle table of solid wood. The pedestals on their bases each consist of three large pieces of wood. Two pieces carved to curve inward brace the large central leg of each pedestal. The trestle is also thick, and great bolts secure it to the ends. With each giant piece of the Barstow being solid hardwood, this table is built to last. The Barstow Dining Table is handcrafted to support grand dining events long into the next generation. Your dining table is the gathering place for your household. An heirloom table has the craftsmanship that you can rely on. Solid wood creates beautiful Amish dining table and chairs. The feature common to hardwood dining tables is the large stained table top, shimmering with woodgrain. That is, unless a painted surface is best for your style. Other features common to these Amish made dining room tables include mortise and tenon joinery for maximum strength, and thick table tops: unless otherwise noted, all of our table tops are a full inch thick. Amish made dining room tables make a statement in a variety of top and base styles. Each table has a table top shape unique to its design: square, oval, and boat-shaped are just a few. Table top edges need not be simply squared off. Bevel, roundover, and champfer edges are among many options for outlining your table top and adding subtle dimension. Table bases come in virtually every shape you can think of, including great sturdy trestles, sophisticated pedestals, and elegant legs. For entertaining, many of our Amish dining tables can receive up to four leaves, expanding up to ten feet long. Self-storing leaves stow conveniently inside the table. For supporting extra weight and opening easily, table glides are designed to balance your needs. Ball bearing slides offer smooth, easy gliding action and can expand tables enough to accomodate most households' needs. Also available are robust geared slides, and ultra-strong wooden slides. Finishing your Amish made dining room table sets the mood for your dining area. Our wood, stain and paint types can result in hundreds of possible combinations. Call us, and you can even order custom finishes. Burnishing gives a table an antiqued look, while a two-tone finish can make your dining room look smart and intentional. Whatever your home style, an heirloom-quality Amish dining tables provides joy and function that you and your family will love for generations.